His mother was a chops-and-peas sort of cook, exasperated by the highs and lows of a temperamental stove, a finicky little son, and the asthma that was to prove fatal. His father was a honey-and-crumpets man with an unpredictable temper. When Nigel’s widowed father takes on a housekeeper with social aspirations and a talent in the kitchen, the following years become a heartbreaking cooking contest for his father’s affections. But as he slowly loses the battle, Nigel finds a new outlet for his culinary talents, and we witness the birth of what was to become a lifelong passion for food. Nigel’s likes and dislikes, aversions and sweet-toothed weaknesses, form a fascinating backdrop to this exceptionally moving memoir of childhood, adolescence, and sexual awakening. 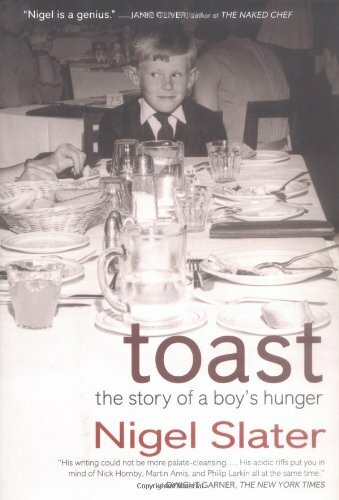 A bestseller (more than 300,000 copies sold) and award-winner in the UK, Toast is sure to delight both foodies and memoir readers on this side of the pond—especially those who made such enormous successes of Ruth Reichl’s Tender at the Bone and Anthony Bourdain’s Kitchen Confidential.